Bo (grey and white, old male 6lbs) and Brownie (brown, female 3 lbs)- These sweethearts came to us from their previous owner that raised them since they were babies; she loved them very much but unfortunately her husband is very allergic to them. 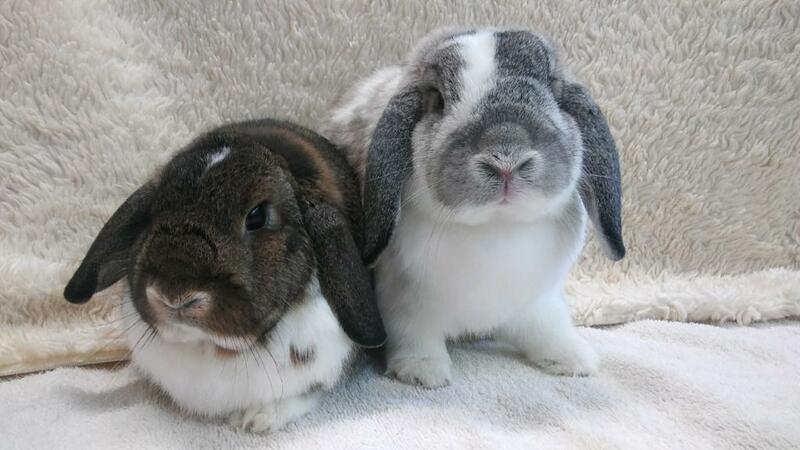 Their previous owner tells us that Bo enjoys head scratches and exploring while his bunny wife, Brownie is a little princess who loves eating banana treats and being groomed by Bo. Brownie is mischevious and brave whereas Bo is shy and easygoing, what a great balance! These love bugs must be adopted together, they are a married couple and they would love to share their joy with their forever home.